You get my point. It’s fast. It’s simple. It also requires zero cooking skills and pretty much not even chopping skills. You just need a blender, Magic Bullet or food processor that does the work for you. Traditional pesto has quite a bit of olive oil and parmesan cheese. It’s pretty easy to cut down on the calories by lowering the oil. Creaminess, however, is another story when you leave out the cheese. I’ve got an easy solution though. Just like using beans in risotto to add to the creamy texture, you can use beans in pesto. In fact, you can even use the leftover beans from the risotto in this recipe before they go bad. Cook the pasta according to package directions and reserve 1/2 cup of the pasta water. I just scoop it out with a measuring cup while the pasta is cooking. Set it to the side. Place everything but the pasta and tomatoes in a blender, food processor or Magic Bullet and pulse a little bit to blend. Add a little of the reserved pasta water to help it blend and puree it smooth. Drain the pasta and toss with the pesto mixture. If needed, add a little more of the reserved water to the consistency you like. Divide into bowls and top with the diced tomatoes. Makes 4 servings at approximately 310 calories each – 27g protein, 28g carbs, and 10g fat. The avocado in the recipe adds a little bit of healthy fats and also helps with the creamy texture and flavor of the sauce. I loved the flavor combination of everything and all it took was about 10 minutes to boil the pasta, toss, and get it on the table. 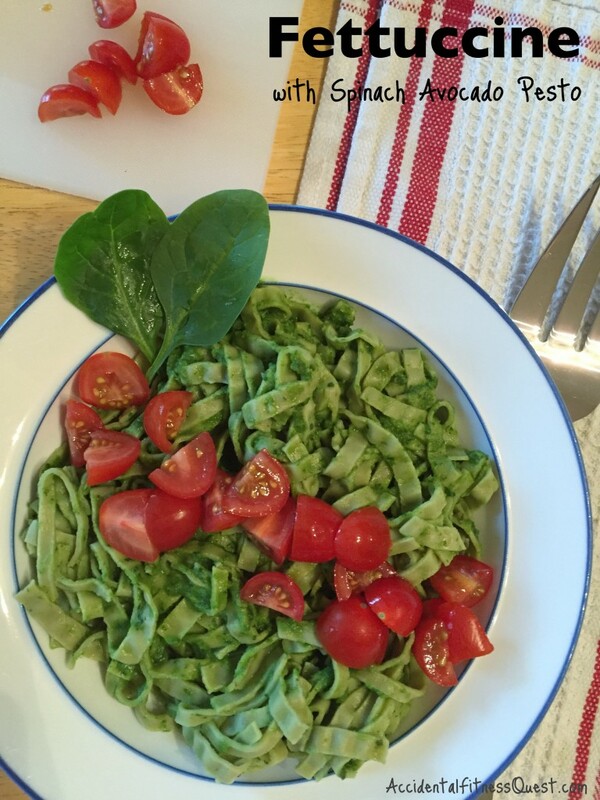 I used the high protein edamame pasta, but sub in any shape or type of noodle you have. You can even use gluten free pasta and add protein like chicken to round out the dinner. It doesn’t get much easier than this. It’s also a great recipe for those hot summer days where you don’t want to heat up the kitchen.